Yesterday I had hoped to run 10 miles. Weekends are the only day I can really get outside to run, so I save my longest run of the week for either Saturday or Sunday. I don't have a triple jogging stroller (although we do have a Bob single and double so as long as Paul is with me we are able to run with all the boys). We woke up to ice and rain yesterday, and I resigned myself to running on the treadmill. Yes, I can run outside in that type of weather (and have before) but things were really muddy on our trails so the treadmill seemed a better option this time. It seems as though the minute I got on the treadmill Cort started screaming. I got off four times over four miles to soothe him and reinsert the pacifier. The fourth time I'd had it and just gave up. Some days are like that. But all afternoon I felt disappointed in myself for not getting a longer run in. 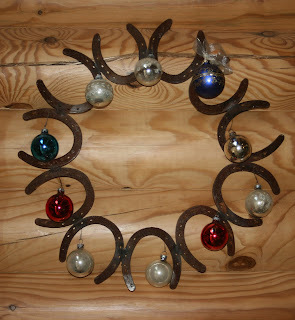 Once Paul got back from taking the neighbor's the horse shoe wreath he'd welded for them, I decided to have another go at the treadmill. I did an additional 5 miles to make 9 total (having to get off to make dinner after 9 miles). No, it's not the same as doing 9 or 10 straight, but it was much more acceptable for me and I was able to feel better about the workout. And I'm hopeful that next weekend's 10 miler will happen a little easier. I try to stay in 10 mile shape (to where I can just go out and run 10 miles at any point without it being a big deal) year round. Although I've run several 10 milers post-partum, I'm not quite at the point yet that it feels like it's not a big deal. Hopefully that day will come soon. My favorite post-long run meal is a stir fry. 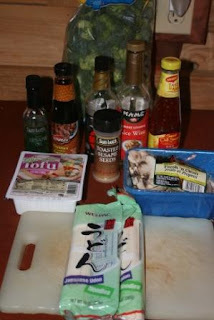 I use a variety of Asian sauces (nope, can't get those at Sam's), tofu (also not available at Sam's), and fresh veggies. Start by sauteing some garlic in sesame oil. I buy garlic in bulk and prep it ahead of time by chopping it, then toss it in the freezer and pull out as needed. This saves me a lot of time in cooking since I use garlic in practically every meal I make. 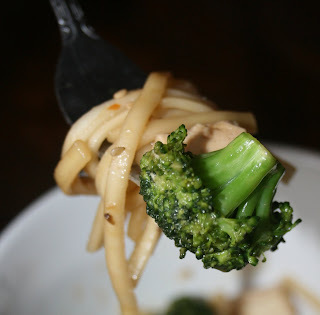 Sesame oil doesn't do well at high heats, so you don't want to cook this meal too hot. Toss in some drained, cubed tofu and add the other sauces you want to use. Meanwhile, I prepare some soba or udon noodles. 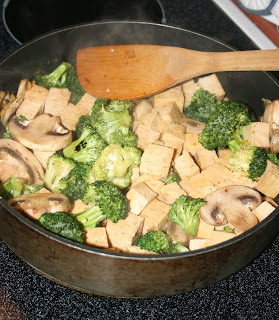 Add fresh veggies to the tofu (I love broccoli, red peppers, baby corn, and mushrooms in stir fries). As a finishing touch, sprinkle with toasted sesame seeds. So good and fast, and the tofu gives my legs lots of protein to recover from a run.